As work slowly creeps more in to our home lives, incorporating a work space in your personal space in a fun, design-driven way can be tough! But with the versatile design and fun styles of our favorite Inspire Q desks, it’s easier than ever to create a fun space when you need to get serious. Check below for some of our tips on managing that work-life balance with chic style! Short on space in your home? Consider placing a writing desk behind the couch! Not only can you keep an eye the kids and stay part of the action, but you’ll also have a great piece to add to your room. If your living rooms trends towards neutrals, consider adding a desk with a pop of color, like the Lyndale Writing Desk. Two drawers and a deep top mean you’ll have plenty of space to store supplies and spread out your work, and the soft blue finish provides a pleasing tone that might make you forget about all that stress. Since the piece is part of your living space, this is the perfect opportunity to showcase more photos and favorite finds from your travels. 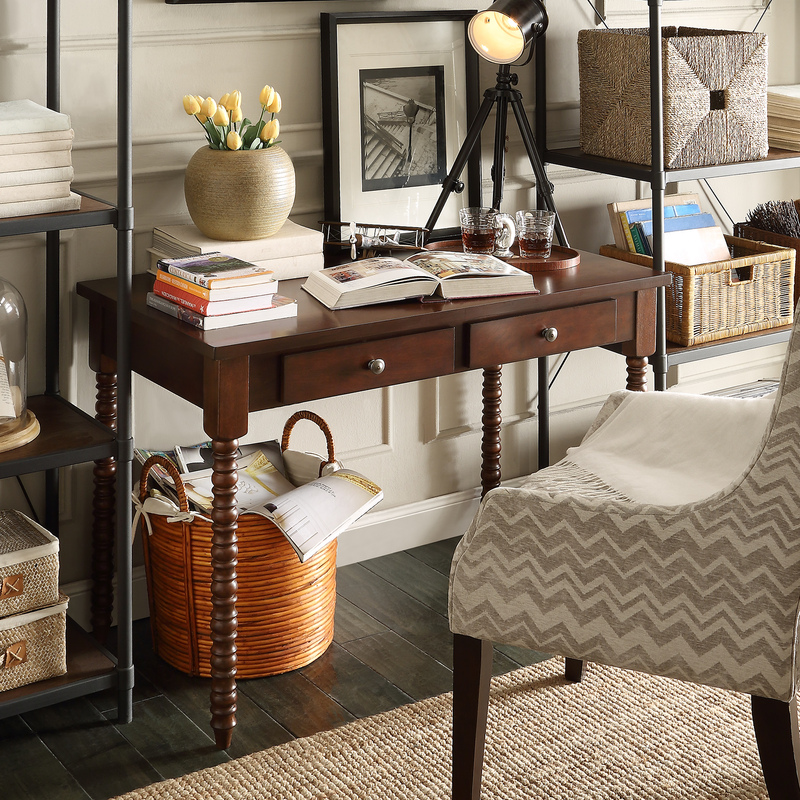 Create a private moment by flanking your desk with some light open bookshelves. The added pieces will help construct a barrier between you and environmental noises, while providing some stylish storage to boot! Contain files and clutter with decorative boxes that add to finish of your desk, like pairing textured accents in natural colors with an espresso finish. This calming collection of textures and colors will help you get that pesky work done quicker so you can be on to better things – like redecorating, perhaps. Make the most out of that corner in your living room with a small scale option like the Daniella Writing Desk. Perfect for the urban dweller, this desk is perfect for casual browsing at home. Flared legs and a scalloped apron bring chic style to this piece, while a double knobbed drawer offers handy storage. With its clean white finish, this desk works well with unexpected pops of texture and style, as seen with our cowhide print-topped contemporary chrome stool. Are you a late night reader or worker? If so, this may be the set-up you’ve been missing in your bedroom! All of us at Inspire Q love the versatility of this desk! – It can be used in any room and still look great. Your desk placed next to your bedside is a bold move, but it’s also a smart one! Catching up on work, or simply reading a book is proven more beneficial in a room of peace and serenity. The most peaceful room in your home is (hopefully) your bedroom! Place a little table lamp on your desk and you’ll be good to go! This desk is for the lovers of all things shiny! Aside from its complete beauty, this piece is just as functional as it is gorgeous, and when placed in a small area can make any room forget about its size.